The recently released book, ANDA Litigation, provides both a ready roadmap for novice litigators in the field as well as more detailed material and strategy to assist the more experienced ANDA litigator. The first part details the Hatch-Waxman Act and how it was implemented. Practical tools in these chapters include: an overview of the drug approval process, including required notice and pre-litigation considerations, and issues related to the timeline of litigation. Following this, the authors explore even deeper into the actual litigation under the act, with topics covering: responses to the complaint, discovery, the work of experts, and patent claim construction and summary judgment. Further chapters are practice-focused, covering issues including preparing the case for trial, the work of trial, managing the litigation process, and post-trial issues, including appeals to the U.S. Court for the Federal Circuit. Finally, the authors discuss remedies, settlement, and antitrust implications, and the book also includes chapters on regulation and litigation of pharmaceuticals outside the U.S. Please visit the American Bar Association’s bookstore to learn more or to order a copy of this new book, ANDA Litigation: Strategies and Tactics for Pharmaceutical Patent Litigators. The Hatch-Waxman Act with it amendments is a hybrid of two already complex areas of the law -- U. S. patent law and FDA regulatory law -- which makes patent litigation in this area especially complicated and hotly contested. 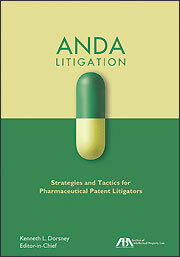 ANDA Litigation: Strategies and Tactics for Pharmaceutical Patent Litigators is a single-source guide examining the intersection between the statutory and regulatory scheme governing approval of generic pharmaceuticals and U.S. patent law in the context of Paragraph IV ANDA litigation. In 19 detailed chapters, this single-source reference focuses both on the current and developing law as well as the strategies and tactics employed by the litigants.